Students from the inaugural M.S. in Strategic Communication cohort in San Francisco. 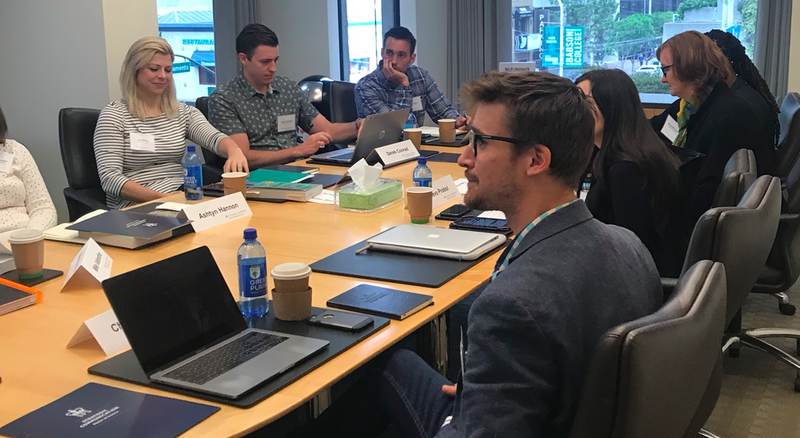 The hybrid cohorts of the Master of Science programs in Applied Analytics, Bioethics, and Strategic Communication programs at Columbia University’s School of Professional Studies began their first in-person intensive study last month. The Executive Technology Management program’s San Francisco-based intensive study will begin in October. Hybrid study combines mostly online coursework with several consecutive days of intensive, in-person coursework during most terms. SPS has further enhanced its presence in San Francisco through the Career Design Lab, which integrates academic programs with outreach, professional development, and alumni connections. “Working professionals looking for advanced degrees delivered with rigor and flexibility will benefit greatly from what the Columbia University SPS Career Design Lab brings to the West Coast,” says J.D. Schramm, Faculty Director for the Career Design Lab and Senior Lecturer. Fall 2019 applications are open for all programs at Columbia University’s School of Professional Studies. Learn more about options to study online.